New Avant2Go electric car sharing stop in BTC City Murska Sobota • BTC d.d. Since mid March, BTC City Murska Sobota boasts a new stop for the Avant2Go electric car sharing. The stop also includes a modern charging station, intended for all drivers to charge their electric vehicles. In 2016, when BTC City Ljubljana became home to four stops for electric car sharing, the BTC Company and the Avant car Company expanded their network of stops in the system Avant2Go also to BTC City Murska Sobota. 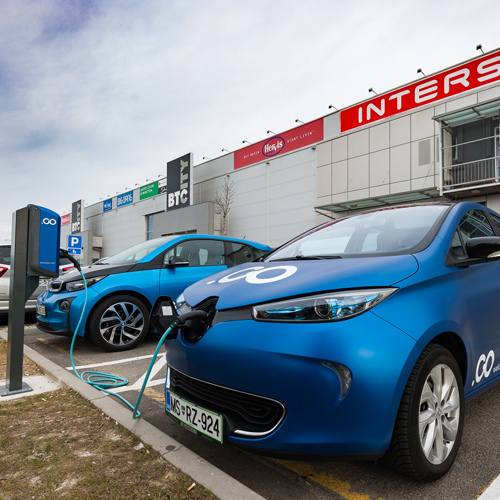 At the new stop, located in the parking lot of BTC City Murska Sobota, visitors can pick up and return BMW i3, Renault Zoe, Smart ED and Nissan Lead electric cars as part of the car sharing system. The new stop offers three parking spaces: two are intended for electric vehicles included in the system Avant2Go, while one is available for use to drivers of other electric vehicles. The new stop provides a modern, compact, and smart charging station that enables charging of all electric vehicles – those included in the system as well as all other electric vehicles. This charging station is the first of its kind in Murska Sobota and it operates according to the “attach and charge” principle, which provides simple use without any prior identification. The user activates charging by attaching the vehicle to the charging station. Another advantage of the charging station is the possibility of simultaneous charging of two vehicles, each with a charging power of up to 22 kW. The average electric vehicle is fully charged in about one hour. Electric mobility represents one of the key opportunities for transition towards lower carbon dioxide emission. The co-use of electric vehicles additionally reduces the level of harmful emissions into the environment, reduces traffic density, and contributes to cleaner air. By setting up Avant2Go car sharing stops, the BTC Company has made a step towards encouraging sustainable mobility among visitors to all three BTC Cities. Within the scope of their strategic partnership, the BTC Company and the Avant car Company continue developing solutions in the field of sustainable mobility for smart cities. With the promotion of innovative green technologies, the BTC Company puts into effect its social responsibility and sustainable growth, benefiting not only current but also all future generations.